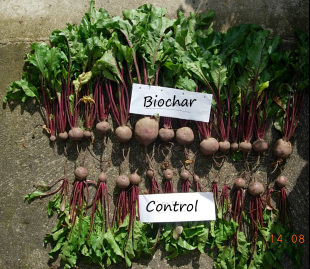 We provide biochar and biochar advice to farms. We are currently working with River Cottage, George Thompson Ltd, and Oxford University Parks. We supply biochar and set up trials to quantify the benefits of biochar in terms of increased productivity and decreased use of synthetic fertilizers. We can advise you on climate smart agriculture and how to maximise the productivity of your organic soil using this ancient organic farming practice. All our products are 100% organic, approved for use at River Cottage by the Soil Association, carbon negative and locally sourced, ensuring your organic patch is truly climate-smart. Please contact us if you would like to stock Oxford Biochar. 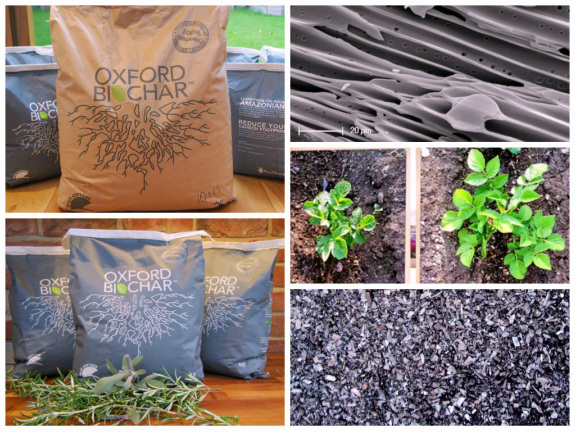 Oxford Biochar bags of pure biochar, available in 3 kg & 10 kg. Please note: these are 100% biochar, not a compost mix. Mix pure biochar to home made or commercial composts for best results, or directly to soil if you just want to improve the quality of your soil. We do not add mycorrhizae or fertilizers to our biochar, as soils harbour different species of mycorrhizae and have different nutrient deficiencies to cater for. coupled with vigorous root development when biochar was added to the soil. - Significantly enhances plant growth & root development. - Boosts plant nutrient retention. - Improves soil structure and stability. - Improves soil water holding capacity & permeability. - Raises soil pH (i.e. reduces soil acidity). - Retains nitrogen and phosphorus in the soil. - Helps healthy activity of soil microfauna & flora. - Provides refuge for microrhizae, for healthy roots. - Suppresses odours & breaks down pollutants. Oxford Biochar is sourced locally using excellent quality agricultural waste. By using 1kg of biochar, you are putting 800 g of carbon back into the soil for thousands of years, helping you reduce your carbon footprint. Fertilizer production is the biggest source of greenhouse gas emission from the UK farming industry. The use of biochar restores soil fertility for thousands of years, sinificantly reducing the need for fertilisers and herbicides. Biochar-rich soils prevent methane and nitrogen emissions from the soil (potent greenhouse gasses). We are committed to ensuring the use of our products will result in quantifiable emissions reductions. So all our products are Carbon Neutral. One bag of pure biochar contains 1.2 kg of carbon, so your carbon footprint will be reduced by burying it into the soil.